Apple's iTunes store is listing that an English version of Hatsune Miku's song "Tell Your World" will be released March 20. The listing currently features a 90-second preview of the song. The Japanese version of the song is already available on the U.S. iTunes store. Composer kz wrote, scored, and arranged the original song — which was featured in a multi-award-winning Google Chrome commercial — under the unit name livetune. 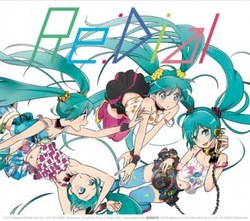 The English version of "Tell Your World" will also be included on livetune's new Hatsune Miku album Re:Dial, which is also slated for release on March 20 in Japan. Re:Dial will include the song "Redial," which will feature a music video from contemporary artist Takashi Murakami.